Atlantyca flagship property, “Geronimo Stilton,” the animated kids series is on Amazon Video, for streaming by Amazon Prime members. Commencing immediately, Atlantyca joins Amazon’s Streaming Partners Program, offering all Amazon Prime members immediate and unlimited access millions of Amazon’s Prime members (US-based) immediate and unlimited access to 52 episodes (Season 1 and 2) of the globally popular and award winning “Geronimo Stilton” animated series adventures. The agreement was managed by Atlantyca’s US agent and IP management company, Global Genesis Group, official aggregator to Amazon Prime. “We are very proud to be on their platform and we can’t wait to start this collaboration,” Caterina Vacchi, Atlantyca Entertainment’s Head of Animation and Executive Producer. “Amazon is considered the largest internet-based retailer in the United States, Amazon’s Streaming Partners Program, an over-the-top streaming subscription program for video providers enables them to reach tens of millions of Prime members. 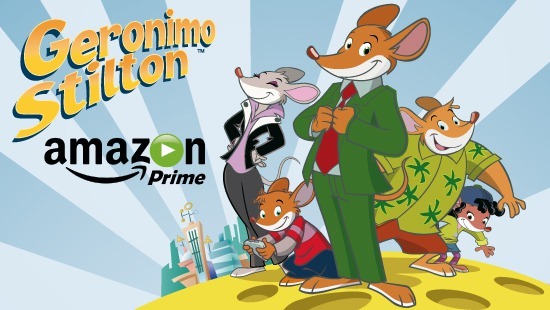 This new partnership permits us to get our content to Amazon’s Prime members easily and quickly, bringing Geronimo Stilton’s animated stories to our US-based fans. In addition, kids today seek easy access to entertainment on a variety of hand-held devices and platforms. With Amazon’s extensive integration on connected devices this partnership adds more devices and more viewers. We could not be more thrilled and are very excited to announce this first major SVOD deal for North America.” Rick Romano noted, “Global Genesis Group is excited to be the company behind bringing the worldwide phenomenon of Geronimo Stilton to US by placing the show on Amazon Prime. Our company has been recipients of numerous emails and messages by parents, thanking us for providing a fun, family show like Geronimo for their children. It is such a popular book series in North America and now all the Geronimo fans can watch their favorite character on Amazon." Based on the popular best-selling children's book series of the same name, “Geronimo Stilton” the animated series follows the adventures of Geronimo Stilton, mouse editor extraordinaire of The Rodent’s Gazette, and his friends in New Mouse City as they uncover mysteries with often hilarious consequences.